If you’re looking for a career change and want something with rock-solid security, consider becoming a plumber who makes house calls. This advice is based on two truths: 1) people will always need plumbing—or more specifically, plumbing that actually works—and 2) people will always do stupid things that stop their plumbing from working. Keep in mind that the service side of plumbing often requires a strong stomach and the will to suppress amusement at other peoples’ self-imposed misfortune. But rest assured the two truths mentioned above will always keep you in business. The items below are just a small sample of what you might expect on an ordinary day in the field. 1. Leaving hoses connected during winter. This is a classic plumbing error that one must assume is caused most often by extreme laziness. 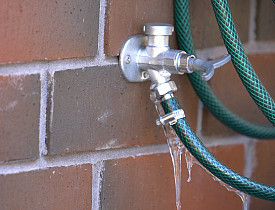 Unlike holiday lights, hoses can cause damage when left out all year: they can lead to freezing of the sillcock (outdoor faucet) or its water supply pipe. It’s terrible for your hose, too. 2. Using vent pipes for anything other than venting. This one falls in the “Why not? I’ll tell you ‘why not’!” category. There are reports of homeowners running things like TV cables down the plumbing vent pipes that come up through their roofs. Seems like a tempting solution to getting into the house, but vent pipes aren’t just there for their bad looks. They not only provide air to drains inside the house, to prevent a suction effect that inhibits drainage; they also get rid of sewer gases that come up from the city’s sewer main (see item 9, below). If you cut a hole in your vent inside the house to run a cable through, you’re tapping into an endless supply of your neighborhood’s sewer air. Nice picture on the TV, though. 3. Using too much drain cleaner. When used judiciously and as directed, on the right kind of clog, drain cleaners can be effective and relatively safe for drains. When used with abandon, they can corrode some drain materials, and they can actually make clogs worse. It’s also not very nice for the plumber who eventually comes out to clear that clog. 4. Pouring chemicals (and other bad stuff) into a septic system. If you’re used to living with a “private” sewage system, you probably know how to take care of it. But if you just bought a house with septic, or maybe you’re renting a rural cottage for the summer, you might not think twice about using chemicals like drain cleaner, chlorine bleach, paint and even anti-bacterial soaps. These chemicals kill the essential waste-eating bacteria in the septic tank ... and you can guess the result. Also, items 7 and 8, below, should serve as a double-warning for septic users. 5. Screwing, nailing or cutting into a wall with hidden plumbing pipes. Now we’re into the realm of “Oh, yeah. I did that once.” Do this with a screw and you might hear a fine spray of water hitting the back of the drywall. Do it with a reciprocating saw and you’re in for a gusher. 6. Joining two different metals in piping. DIY plumbers beware: When dissimilar metals, such as copper and steel, are touching, a process called galvanic action leads to corrosion. Corrosion leads to leaks. Such joints must be made with a dielectric union or other approved fitting. 7. Pouring grease down the kitchen drain. 8. Putting everything else down the kitchen drain. Even if you’re not guilty of grease disposal, you might be one of those folks who thinks a food disposer (garbage disposal) is the equivalent of a space-fantasy ray gun. It’s not. It’s a motor with a spinning wheel that has two metal teeth thingees, and it does very little to stop the following from clogging your drain: flour, rice, potato peels (and some other veggie peels) and many fibrous foods such as asparagus and chard. 9. Removing a sink drain. This is not a common stupid mistake, but it warrants mention because it was part of a home-page website feature of a certain newspaper that happens to be the preeminent newspaper in the country (hint: rhymes with “blue dork limes”). The feature showed a houseful of very well-meaning college students who had taken several steps toward greening their everyday lives. One such action was to remove the P-trap and other drain parts underneath their bathroom sink so the wastewater could be collected in a bucket and used to water plants outdoors. While the use of gray water is the jurisdiction of the local health department, the issue here is the 1 1/2-INCH HOLE PUMPING SEWER GAS INTO THE BATHROOM. You have to plug that drain pipe, kids (see item 2, above). 10. Using the toilet as a trash can. Saving the best for last...We all know it’s stupid, and we all do it anyway. It’s as though each of us believes that if we can just get it to flush away, it will be magically out of our lives forever. As if, at the other end of the toilet, there is nothing but a black hole, a portal to a subterranean outer space that swallows up everything we discard and whisks it off into oblivion. Unfortunately, that oblivion is a 3-inch drain pipe that leads into another drain pipe, which is THE drain pipe to your entire house. In other words, flushing one improper item down the toilet ultimately can stop up everything in the house. But we do it anyway. And the bottom line is, if it ain’t toilet paper (or you-know-what), it doesn’t belong there. If you've done one of these stupid things to your plumbing, hire a professional plumber to come and take care of it for you. Don't worry, they've seen it all before.